When I was younger, I never cared much about Easter. To me, it was just another holiday when the malls were closed and I didn’t have to go to school the next day. As a grown-up, I started to pay more attention to Easter especially because of the food. Give me an excuse to participate in a food event and I am there. Galentine’s lunch? Sure. Super bowl potluck? Why not. Easter brunch? Done. Easter brunch means just more than the typical eggs and potatoes. 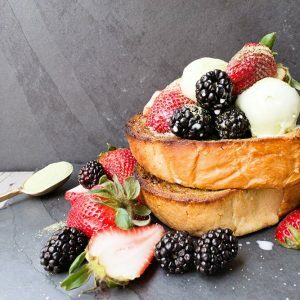 It is one of the most elaborate brunch experiences with everything from ham to seafood to pastries all sitting on one table. To me, salmon and Easter go hand in hand. 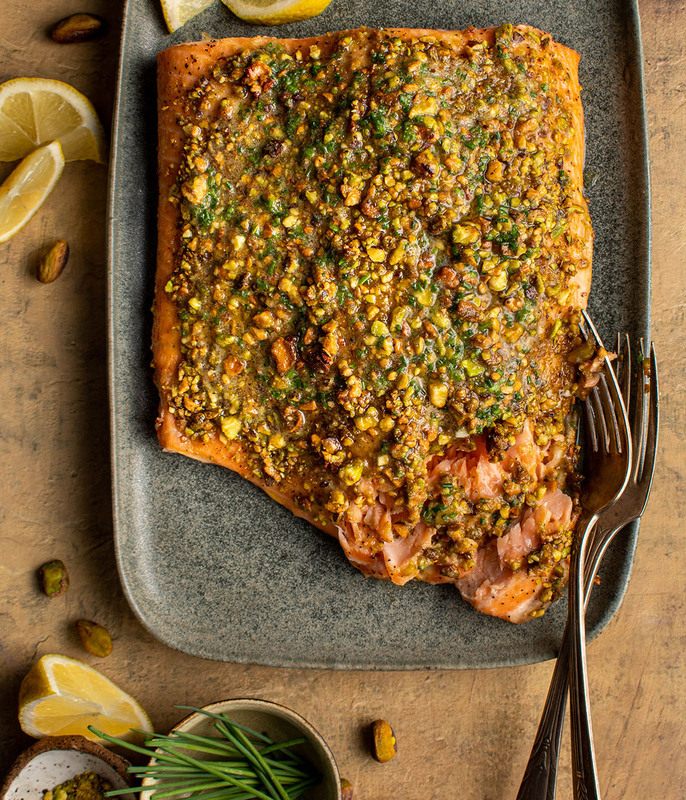 Since I want to partake in the festivities rather than spend all my time in the kitchen, I’ll be whipping up this pistachio crusted salmon with onion chive butter. Ready in less than 30 minutes, this dish is the perfect meal that looks fancy but is actually very easy to prepare. 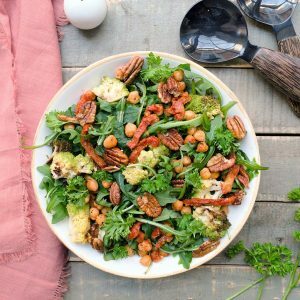 Easter brunch or not, this recipe is a keeper for any time you want a quick meal with great flavors. Season salmon with salt and pepper. Combine lemon zest, lemon juice, honey and Dijon mustard. Spread honey Dijon mustard mixture evenly on the salmon. Sprinkle ground pistachios on top. Loosely cover salmon with aluminum foil and bake salmon for 15 minutes. Remove foil and continue to bake about 5 more minutes or until fish flakes easily. Remove from oven. Meanwhile, make the onion chive butter. Mix together melted butter with onion powder, garlic powder, and chives until well combined. Drizzle on the salmon and serve immediately. One of the first salmon dishes I learned to make was a honey mustard salmon. This recipe is a variation of the basic honey mustard combination adding lemon, onion powder, garlic and chives to the mix. First, combine lemon zest with lemon juice, honey, and dijon mustard. Dijon mustard is the best mustard for honey mustard but you can also use stone ground mustard. Just stay away from the yellow park mustard! Spread the lemon dijon sauce on the salmon and sprinkle a generous amount of pistachios on top. The sauce will help the pistachios stick onto the salmon while giving it flavor, killing two birds with one stone. Bake the salmon at 350 degrees F for 15 minutes or until the fish flakes easily with a fork. While the fish is baking, prepare the onion chive butter. Combine melted butter with onion powder, garlic powder, and chives. Drizzle the butter over the salmon and serve with extra lemon wedges. And there you have it! This pistachio crusted salmon with onion chive butter is so easy to put together but still upholds the flavor and presentation of an expensive salmon dish. A win-win all around!